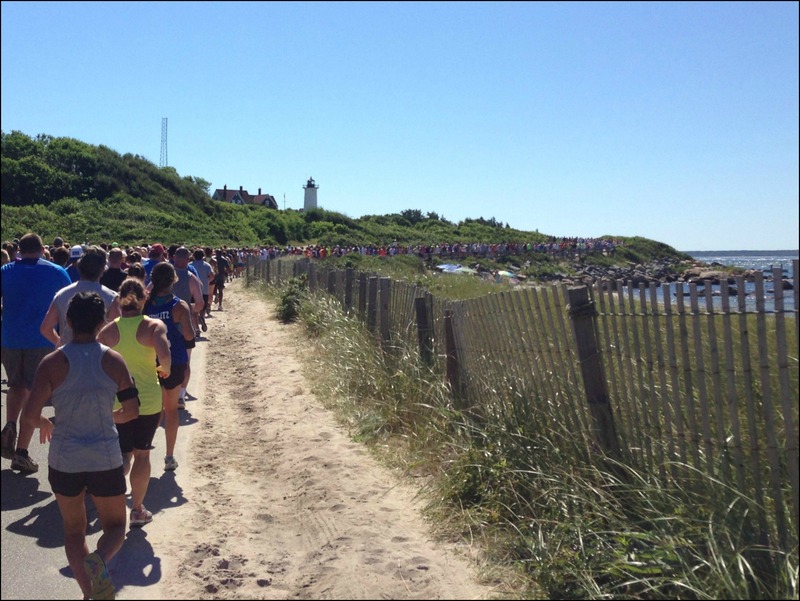 If you missed them, be sure to check out my previous Falmouth Road Race posts! And now, time for The Run! 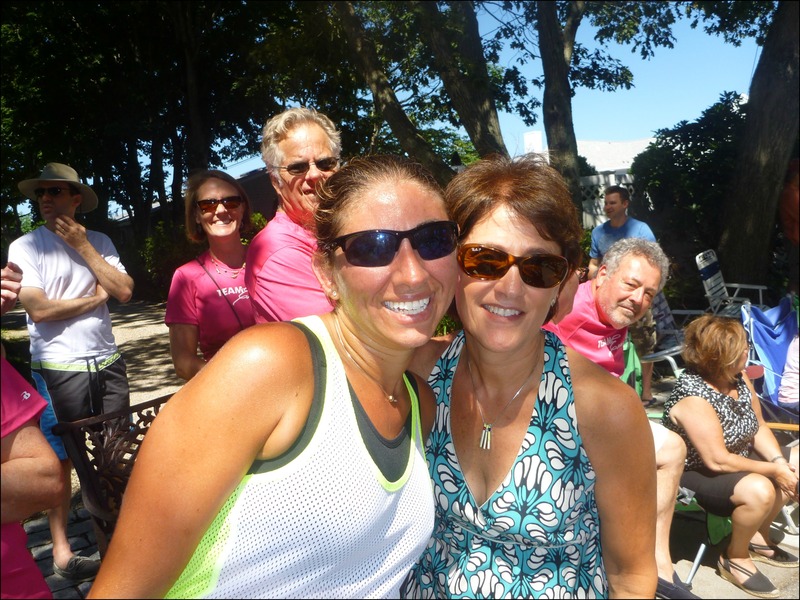 The crowd support I had heard so much about at this race was apparent immediately – as soon as we crossed the starting line the streets were lined with spectators cheering us on! I had been hoping to use this race as a 7 mile tempo run at a 9:05 pace for my upcoming half & full marathon, but as we got closer to the start and it heated up I decided I’d be happy if I ended up around a 9:30 pace. 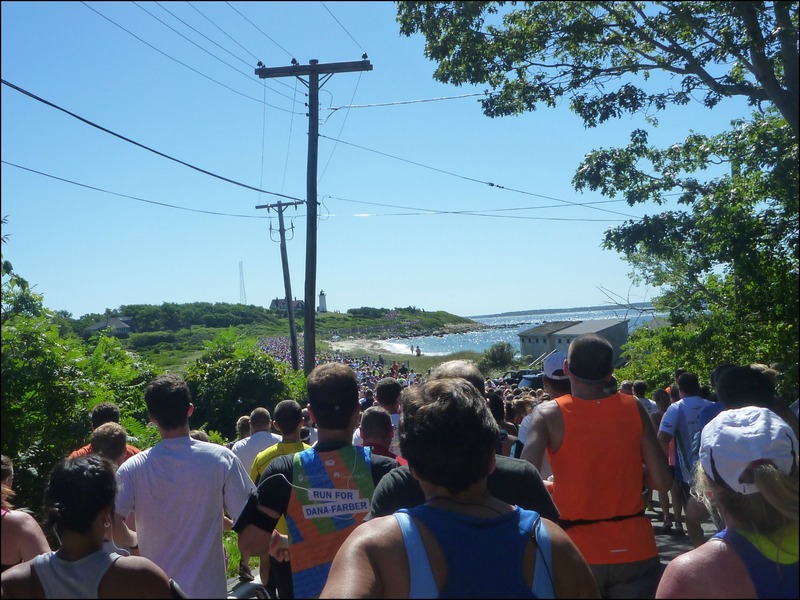 …and as we came around the corner to the iconic Falmouth Road Race view my jaw dropped (and somehow I managed to keep running and not trip over my feet, which if you know me is quite a feat)! Heading towards the Nobska Lighthouse..
…and finally passing the lighthouse! After the lighthouse the next few miles were along a nice shady road lined with trees and cheering spectators! The spectators were generous with high fives (I even ran out of my way to give a little Rangers fan a high five!) and hoses to cool us off. Some even had their own water stations set up (and from what I saw this was not their first rodeo – these were some legit water stations!). I knew my mom was waiting around the mile 6 marker so as I passed mile 5 I text her that I was close (again, you should be impressed that I didn’t face plant…DON’T TEXT & RUN!). And right at mile 6, there she was! I ran over for a quick picture and then kept going (only a mile left!). …we turned towards the last half mile of the race and I felt pretty good on the big climb before the downhill to the finish. Pat even ran ahead and took this great photo, definitely one of my favorite race photos to date! Now all that was left was the downhill to the finish! Unfortunately that proved to be a little too much for me and a quarter of a mile from the finish I may or may not (but probably may) have run to the side to throw up. And with that, my first time getting sick during a race! 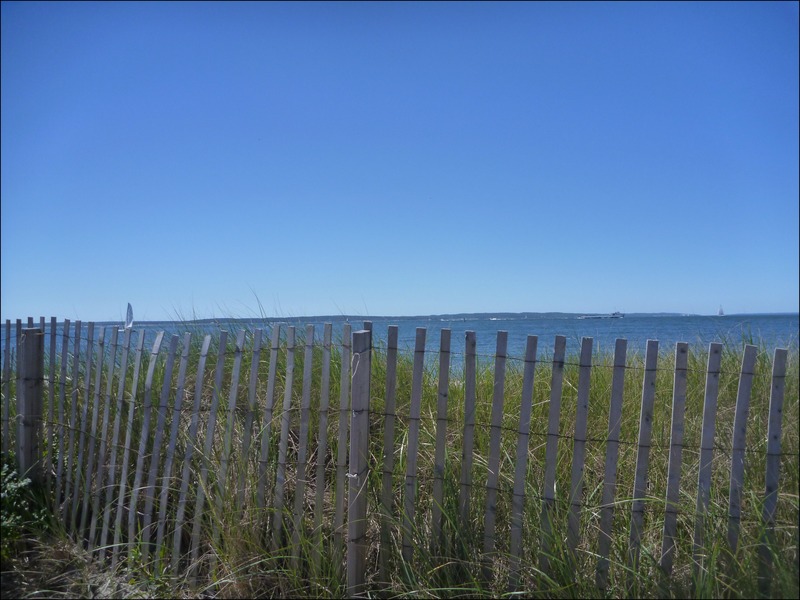 But come on, if you’re going to be sick on the side of the road with the finish line in sight at the end of a hot, humid, hilly 7 miles, wouldn’t you want this to be your view?? 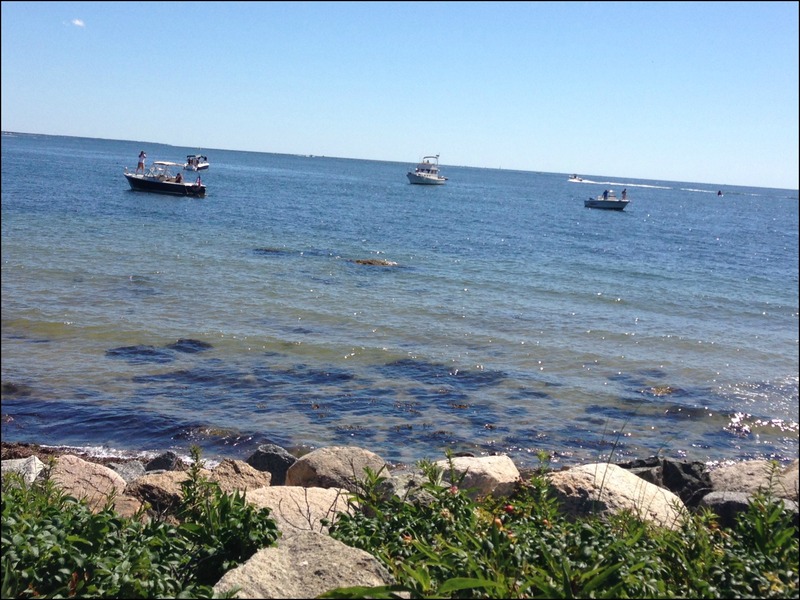 Check out the boat spectators getting a great view of me puking! Fortunately “the incident” (as we will now refer to it as) didn’t last long and within about 20 seconds I was up and “running” and headed towards that finish line! After crossing the finish line I caught up with Pat who I had lost when I turned off for “the incident” and we were pointed in the direction of the post-race refreshments by the volunteers. After the race refreshments we headed onto the field where there were plenty of sponsor booths with other snacks and samples – after 2 bottles of water, some potato chips and a frozen yogurt bar I was feeling pretty good! I took in the scenery, stopped for a picture with my mom and took a short “incident” stop and I still finished in 1:05:56 with a 9:17 average pace – I’ll take it! Overall I LOVED this race and can’t wait to do it again! Since it’s a lottery that only guarantees entry every other year if I don’t get in next year I already decided I’d love to volunteer just to be a part of it! I don’t know that it was really hot enough to need to issue any heat warnings (I think it was mid 70’s), I think it was just the combination of the heat with how hard I was running – low 9’s is a pretty speedy pace for me! 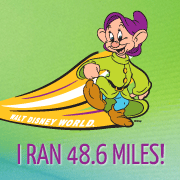 And yes, Disney had heat warnings at Marathon Weekend this year, it was HOT but I took it slow so I didn’t get the point of feeling sick. I was thinking temps of 90s when I was reading it, but yea 70s is much better in general and probably not in need of warnings. As a fellow runner, if there is no breeze, 70s feels much hotter when the sun is beating down and you are working hard (been there!). Your photos are gorgeous. So sorry you got sick, but the warm temps can really cause stomach issues. Yeah, I think I just don’t usually push myself that hard on hot days! Something about races in MA and starting late. Boston used to start at noon. Glad you felt better after water, food and frozen foods. Yup, I felt better right away, still hoping they start the race earlier in the future, I found 10am to be a really hard time! So sorry about “the incident”! But you seemed to handle it as great as can be expected. And this race looks amazing! It looks beautiful! And congrats on your amazing time! …alright, I might have to add this one to my bucket list, preferably if they make it an earlier start time (me + heat = very bad). Haha yeah, definitely add it to your bucket list – if they don’t make the start earlier I’d probably just run easier. I’m not totally sure what I was thinking trying to make it a tempo run! Oh no! I’m so sorry to hear about the incident but I’m glad you were able to finish. Running in the heat is my least favorite thing. That looked like a really crowded course! Yes, it was really crowded, but as long as you weren’t really planning on “racing” it wasn’t too bad, there was a really great community feel! Congrats on an awesome time, and sorry to hear about getting sick…that’s something I have yet to experience (I’ve definitely come close, though! ), but, hey, it’s sort of part of being a runner, right? The heat can really take its toll on the best of us. The photos look STUNNING, what a beautiful course for a race! Sounds like a great time! Yes, I think it was the combination of the heat/ humidity & the large ice coffee I had right before the race (oops!). It was still one of my favorite races I’ve done though! 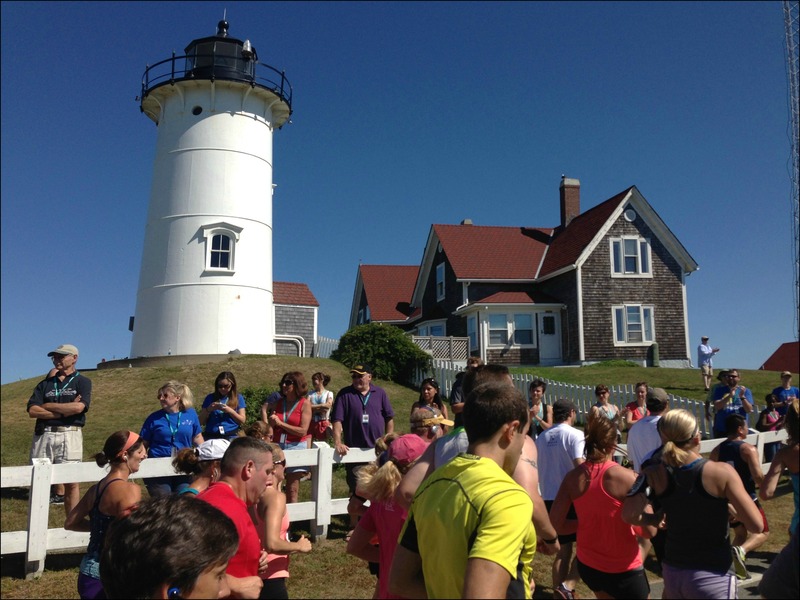 Oh my gosh – this race is going on my list!!! The views are amazing and I love races that have great crowd support. I’m sorry that you got sick. I hate running in the heat. But great job on finishing after the “incident”. Yes, amazing views and crowd support start to finish! 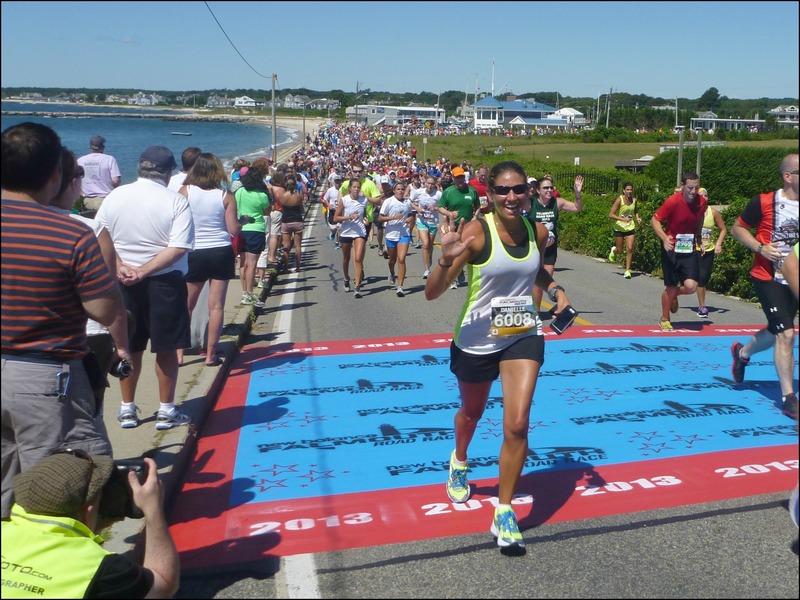 Not sure if you’ve ever been to Cape Cod, but it’s definitely a place worth planning a race-cation for! 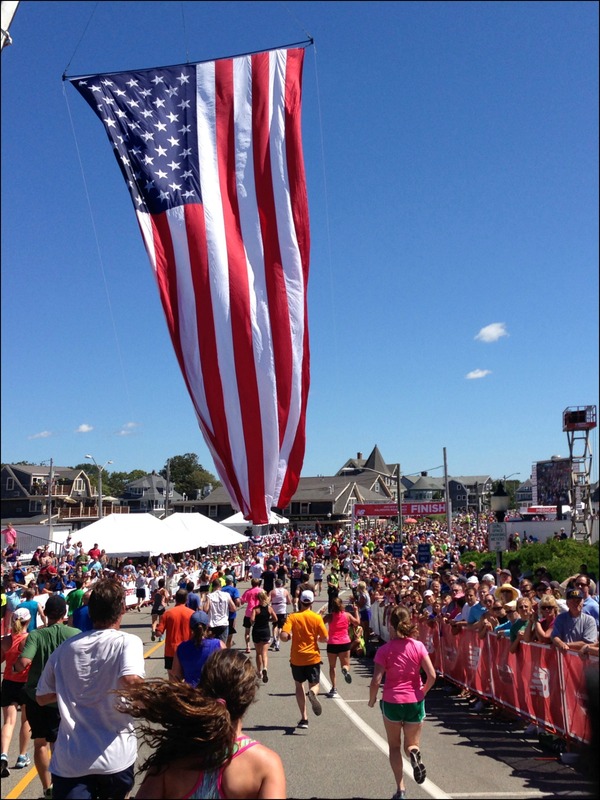 My son ran the Falmouth Road race in 2003 or 2004, and that year the humidity was so bad that the Kenyan runners were passing out at the finish line and one elite woman runner from Russia (I believe) collapsed about 100 feet from the finish line. It was quite dramatic. Holding that race in August doesn’t usually guarantee cool temps and low humidity. My son ran the race again in 2014 and even though it started earlier it was still a very hot race. He finished in around 36 minutes but he said he hit a wall about 5 1/2 miles into the race because of the heat.